Just a quick note to all of you who may be trying to access the v3 SVN repository either directly or through the trac browser. The SVN repository is currently down and not accessible. We are aware of the problem and it is being addressed. This is related to some of the maintenance issues we have had that are being investigated. Thanks for your patience while we address this and we expect it to be back up later today. In the mean time, have a look at the 2.7.0 beta release that is well underway. We’ve got the Queue changes in for Dynamic Agent Penalties and restrictions that we were waiting for as well as the Backup Module changes that were added last week. (Thanks to lazytt/mbrevada/Moshe from Schmoozecom.com for those contributions!) In addition, there is nothing like a airplane ride going from coast to coast and back, with no internet distractions, to add a few more features. If you have been waiting for Outbound CallerID set on a per outbound route basis, or the ability to always force the CID on a particular trunk despite the Extension settings, then go have a look because I have added those as well! For now, we need to get back to this repository issue and will let you know when it is back up. 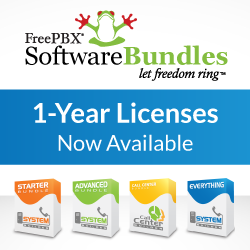 Philippe – On behalf of the FreePBX Team!